Although they didn't do tour posters for Europe I did get 2 from the US tour and got VR to sign them at the M&G. Matt wrote Ireland 03/12/08 on it. I collect posters and if anyone is interested you can still get them on ebay. At the M&G they were well interested in them as the majority of ppl just had the photo they got from Joya. It gave me something to talk about as I was nervous as hell. Heres a link to the posters. I have the green solider and white lady cop posters. The first thing Matt said about the lady cop poster was "damn, she's hot"!! I saw them on Ebay. The one with the green soldier was for one of the shows I was at, The Camden Tweeter Cernter. Pretty cool. 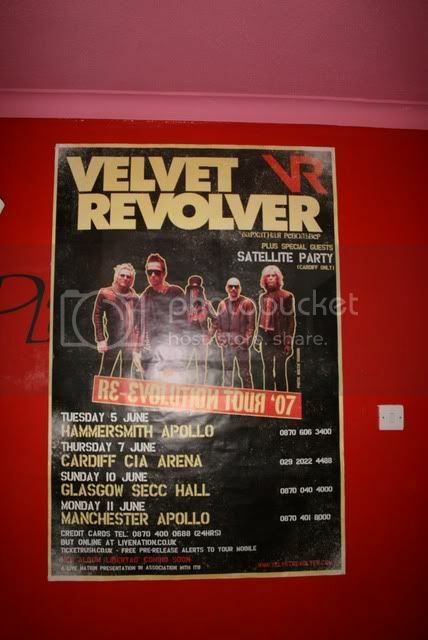 I have a big VR poster about 4-5ft tall of their Re-Evolution tour 2007, it has UK tour dates of 5th-11th June and in the top corner has mention of Special Guests - Satellite Party. got it in a shop in Birmingham (UK) called The Oasis. it's in Priory Square. Thats amazing.I've got a smaller version of that,we looked EVERYWHERE for a full size one like that. Me and my sister have one from the Contraband tour, we paid for it...let me remember...Fook all. We just peeled it off the wall at the Manchester Apollo then ran like the wind.